Custom made to your design or one of our classic rings will set off that diamond you just bought very well. Our rings are made from 14 or 18 karat yellow or white gold or platinum. We use quality heads to hold the diamond for long and durable service. Call us at 1-800-232-9446 to discuss your special needs with our professionals. 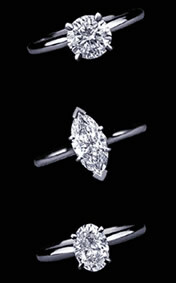 You may need a special custom design to complement your engagement ring. We’d like to help! Please call. Each piece purchased from us is accompanied by an appraisal specifying the quality of the diamond/s, the gold or platinum used and lists a value for insurance purposes. In the case of a diamond which is graded by one of the known gem laboratories, the stone will be accompanied by its certificate.